UPDATE: Euan Mahy from Aurigny was kind enough to call me this afternoon and talk about my post. Rest assured, in Aurigny’s original press release, some of the issues I raised below indeed got a mention, and were scoped in the new agency contract in the first place, which I’m pleased to hear. I urge you to read the full release so you can gather a clear picture of what we (hopefully) have to look forward to as the brand evolves. My comments below are still ones I’d been wanting to raise for some time, and to me, should still be the highest priorities for Aurigny. I look forward to seeing these take shape for the future of the airline. Today I learnt that Aurigny, the inter-island airline brand owned by the States of Guernsey, has appointed a new marketing agency. In a post by the Beeb on Facebook, the contract reportedly includes “refreshing the airline’s brand and [consider] the possibility of renaming it”. And that’s all I know so far. At the moment, I also don’t know which agency has won the work — so I’m proud to now give you my completely impartial opinion on what the devil we need to do with Aurigny. 1. Make the web experience better. I mean, look at it. That thing looks like it was made on Angelfire back in 2001 on a dial-up modem, and I don’t think it’s changed much since. I’m trying to remain sincere, but really— if you’ve tried to use it before I think you’ll agree it’s a horrible user experience that isn’t intuitive; there’s buttons all over the place, GIFs AND scrolling text — this website is like the jack of all trades yet the master of none. 2. It’s time to catch up and go mobile. That’s potentially half of Aurigny’s audience. Half of the people booking flights are trying to so on their phone, and they’ve been neglected; for years. It’s a real shame, and mobile, to me, is something that should be essential to any modern airline— especially when Aurigny’s flights are treated more like commutes rather than big-holiday-spends. I really believe that Aurigny operates a great airline service. The only times I’ve had a problem with a flight, or for it not to run, have usually been because of extraneous circumstances like fog. However, when those occasions have happened, I’ve noticed some real opportunities for Aurigny to better their customer service side — particularly in digital. When a flight I was booked on earlier this year was cancelled due to fog, service updates in the airport were rare, so I took to Twitter to try and find an update and contact Aurigny customer service. 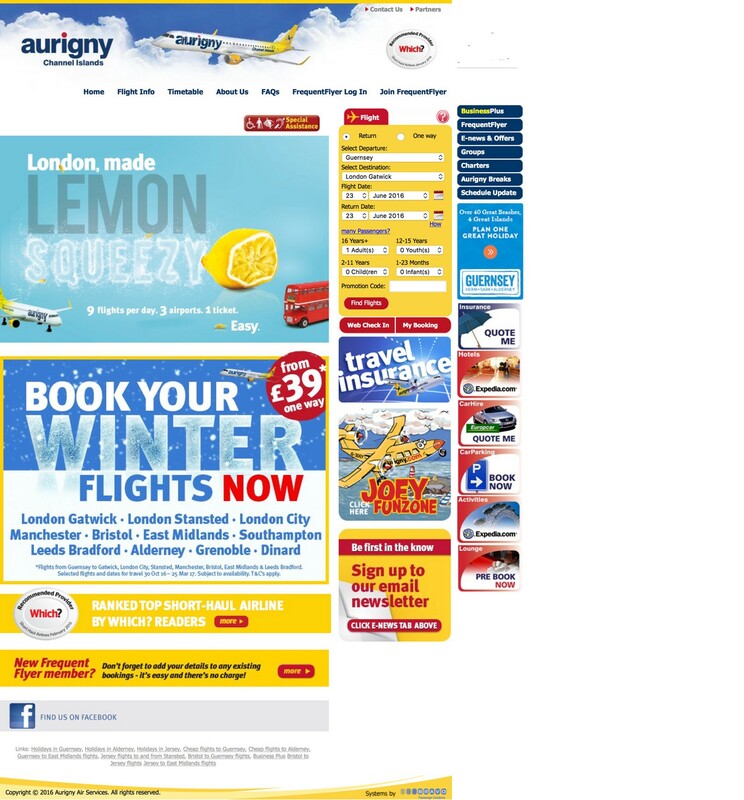 Perhaps unsurprisingly, it turned out Aurigny has no customer support on Twitter. There were no emails about the status of my flight, no texts, and no aftercare. I had to go out of my way to find a post on Facebook (which wasn’t updated), or speak to staff at the airport (after waiting in a long queue where everybody was waiting to ask the same thing). Here’s what upsets me: there’s an app in the App Store for En Route — Aurigny’s in-flight magazine. I can’t get my head around it: they’ve developed an app for the in-flight magazine (which is just a re-skinned PDF viewer, by the way), instead of first making an app for, oh, I don’t know, their product? In case you didn’t know (because it’s not really advertised, so I couldn’t blame you), Aurigny actually have a loyalty scheme. But I’m going to keep this one short: I think it’s a nonsensical, farcical waste of time, which needs a complete overhaul and radical re-thinking. I’ve been signed up for ages, but even I as a regular traveller have never really known how I accumulate points or what those points are worth. Just trying to make it through the FAQ section makes my head want to explode like in that scene from Scanners. And yet there’s so much potential for Aurigny to create a compelling loyalty scheme here, especially when it deals with such a large audience like the Channel Islands. Just think about how much more powerful those £29 seat sales could be if they ran across all channels: email, web, social, SMS, together. You’ll notice throughout this article I’ve not even raised the issue of Aurigny’s branding or naming. I don’t really think there’s a problem with it. Sure, I wouldn’t say it’s particularly enthralling, memorable, or personable, but it’s fine. It’s the only damn airline that operates between Guernsey and London anyway, so why get so het up on what we call it? To Aurigny’s new agency: congratulations, you’ve scored a seriously great account, with a huge reach and a lot of potential. I’d love to work on it. But please — and use me as your scapegoat if needs be — let’s convince Aurigny to sort the fundamentals — the customer experience, first. Then we can perhaps talk about a new identity. Enjoyed this article? Please Tweet it or share it with your friends on Facebook; it’d do me a huge favour.